A handwritten piece of paper inside the photographic package lists the names of the individuals in this family portrait. Standing left to right are: James Leinbach, Massa Warner, Mr. Foltz, and Edward Leinbach. Seated left to right are: Miss Sophia Foltz, Miss Olivia Warner, Miss Emma Leinbach, and Miss M. Foltz. It is possible that this photograph was taken by Traugott Leinbach of Salem. My great, great grandmother father’s slave master family. My great, great grandmother is Betty Lash Koger of Wachovia, known as Bethania, NC. This family is the descendants of Isreal Lash, Betty Lash Koger father’s master. 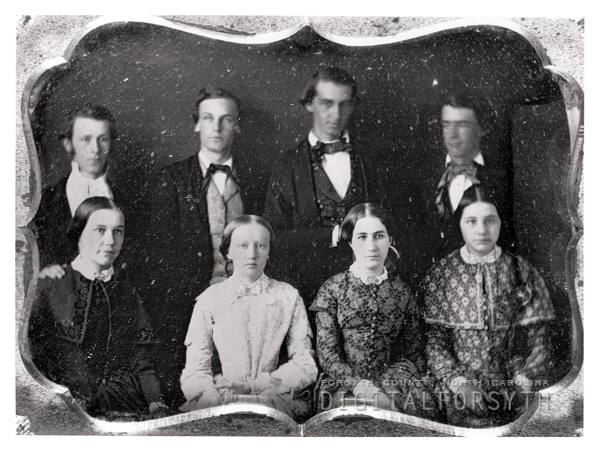 That is interesting but I am not clear on how the 8 people in this picture are connected to your great, great, great grandfather who was a slave. Another interesting connection is that when Lash died after the civil war, and his bank closed, W.A. Lemly, a long time business associate moved north to Main street and started what eventually became known as Wachovia Bank & Trust. According to my research, Wachovia was founded by 12 families from Bethania, N.C. after the Civil War of 1865 along with Dr. Beverly Jones. Yes, Mr. Isreal Lash was a clerk at Cape fear Bank and he later became founder of The First National Bank of Salem which is still in existence today in Winston-Salem, N.C. And no he later died long after the war, he was 5th State Representative after the war and opening his bank according to my research and my great-great grandmother’s slave narrative (Betty Cofer which is missed spelled. Her name was Betty Koger of Wachovia, N.C. known today as Bethania, N.C). And you are correct their names are not mentioned in the picture and I don’t believe it has anything to do with the picture, I just wanted to give my information as it related to this historical web site. thanks for responding. Thanks for the comments everyone. I do not intend for my comments to refer to that the Leinbach family owned my ancestors. My ancestors were of Dr. Beverly Jones’ and Isreal Lash’s plantation. I just added my comments on this page as information. I just started my research and came across this page on Digital Images and posted my comments. Everyone’s comments are correct. It is good to know that others know their history. Thanks for the comments. Her Name was Betty Lash Koger. Yes, she married James Madison Koger. He also named one of his sons James Madison Koger known as Bud and Mat Koger. There were some Kiser in Bethania. They maybe related. Isreal Lash had a slave named Wesley Lash which was Betty Koger’s Father. When Wesley Lash become a free man he moved to Rural Hall and was a farmer. There is a Fire Station on James Madison Koger and Betty Koger land. Fire Station 22. That was the land that Wesley Lash moved to when he was a free man. He had 80 acres of land in Bethania-Rural Hall. James Linebach, the first man on the left, was my great-grandfather. He married Bessie Estelle Reich in Salem on 1893. The following year my grand-father, Jamie Herman Linebach, was born. I am so thrilled to have found this photo!